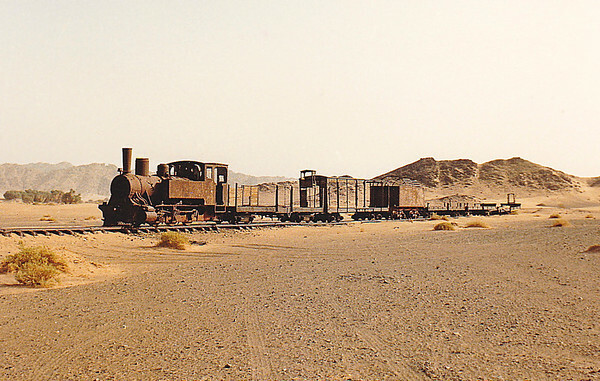 In the Fall of 1989, fellow geologist Walt Venum and I retraced the route of the Hejaz Railway in Saudi Arabia from Madinah to Madein Saleh. 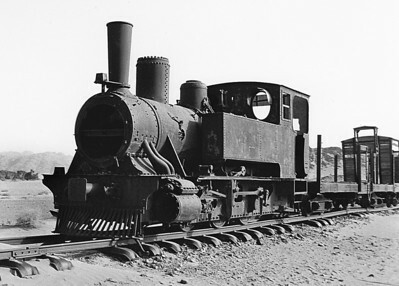 In two Toyota Landcruisers, Walt and I drove from Jeddah on the Red Sea coast to the holy city of Al Madinah, then folowed the old roadbed of the railway built by the Turkish Army around 1904-1905. It was ostensibly built to serve both the military and transport pilgrims undertaking the Haj to Al Madina and Mekkah (Mecca). This is the same rail line that was extensively sabotaged by arab militia units led by Col. T.E. Lawrence (of "Lawrence of Arabia" fame). 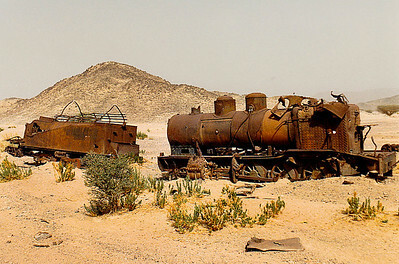 Engine and rolling stock left intact on tracks at a station site somewhere between Mada'in Salih and Al-Ula, Saudi Arabia. 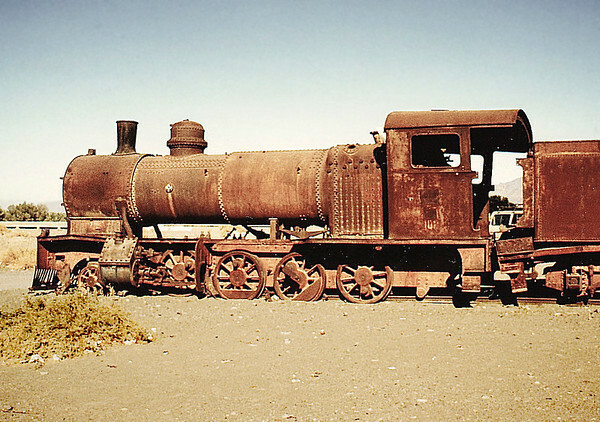 An abandoned WWI-vintage steam engine and rolling stock at a rail siding near one of the scores of fortified way-stations built by the Turks just prior to World War I. 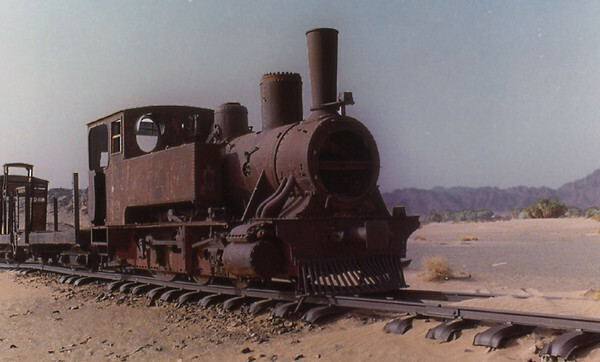 A severely-damaged engine and coal tender off its tracks at a station site near Al-Mu'azzam, south of Tabuk. 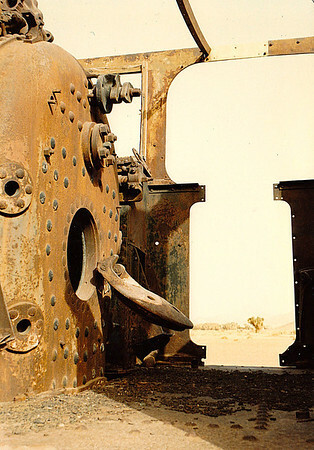 The blown-out boiler hatch of an engine left intact on tracks at a station site somewhere between Mada'in Salih and Al-Ula, Saudi Arabia. 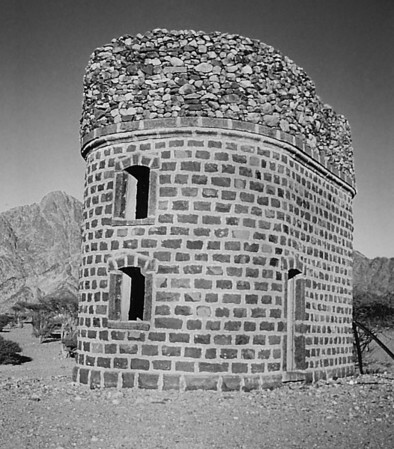 The blockhouse at the Hadiyya Station site. 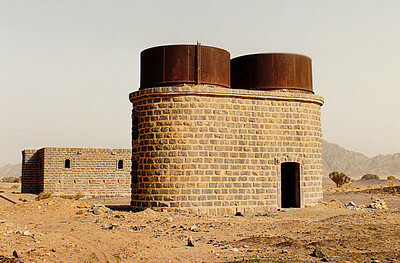 Blockhouse (background) and water tanks at the Abu Naam Station site. 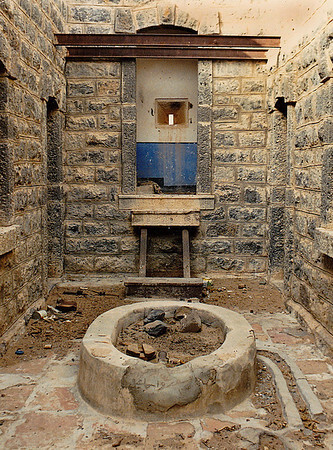 The burned-out interior of the two-story blockhouse at Antar Station. Note centrally-located water well on ground floor. 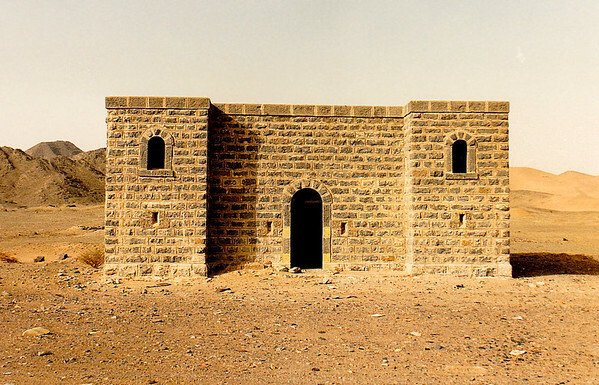 All station structures were built from locally-excavated stone. 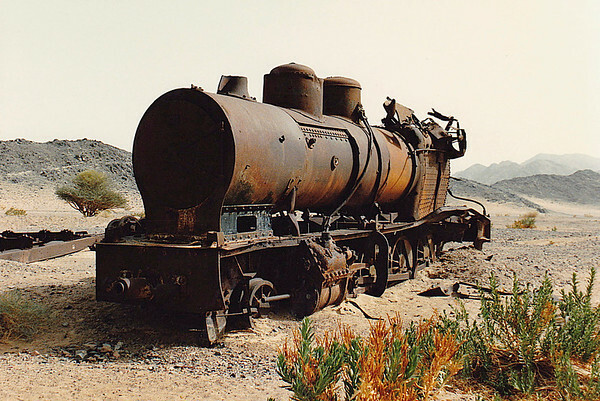 Closeup of the water tanks structure at Abu Naam Station. 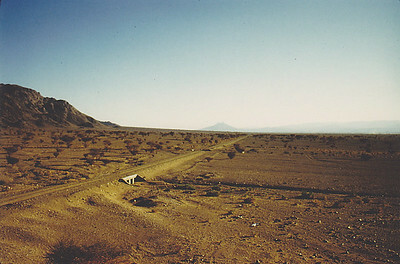 The intact railway station main building at the Tuwayrah Station site. 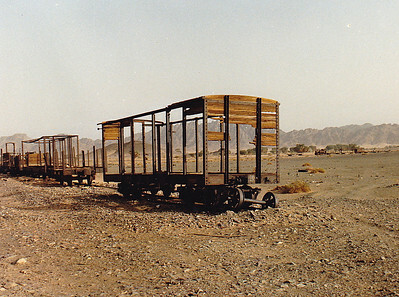 Rolling stock (freight cars) stripped of their wood covering (used by the local bedouin for firewood) at the Hadiyah Station site. 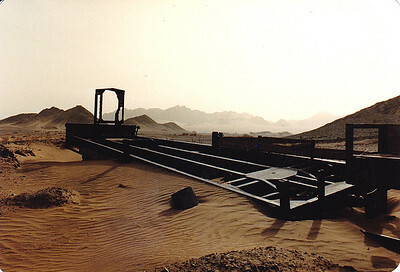 Freight cars stripped bare of their wood coverings at the Hadiyah Station site. 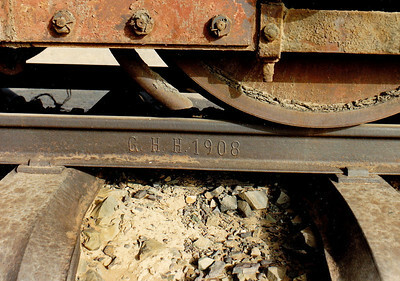 A length of track displaying the date ("1908") this stretch of track was laid. 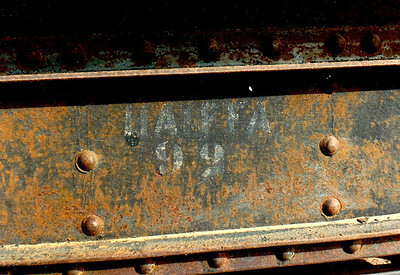 A piece of hardware on rolling stock bearing the name of the city of Haifa in white stenciled lettering. 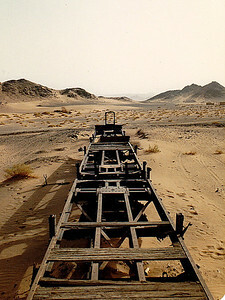 A typical stretch of the old Hejaz Railway's literally "trackless" roadbed that we followed into the otherwise roadless coastal desert of Northern Saudi Arabia. 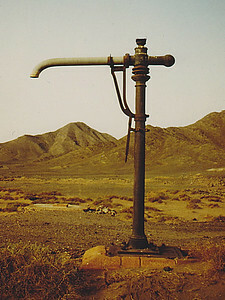 A crane-mounted water hose, Hidiyah Station site. 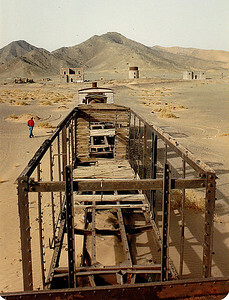 The still-intact rail bridge at Wadi At'il. It and others like it were completely built from locally-quarried stone. 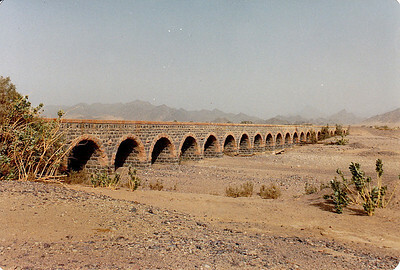 The masonry rail bridges were about the only structure on the railway that showed no signs of wear. 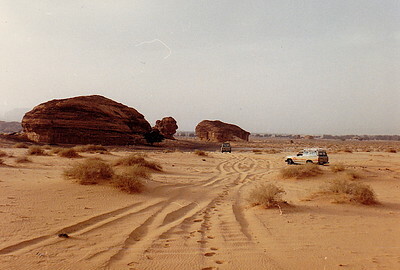 Rock buttes exposed in a wadi outside Mada'in Salih. 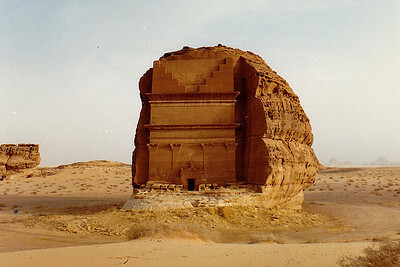 A Nabatean "tomb" cut into a rock butte exposed in a wadi outside Mada'in Salih. 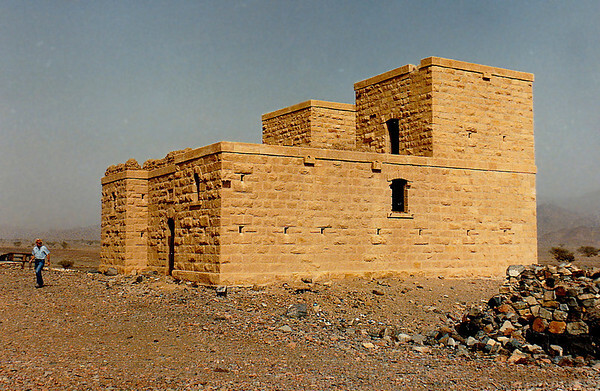 These structures are common throughout the region of the Arabian Peninsula that was once a part of "Arabia Petrae" (the old Roman province's Latin name) and the Nabatean empire.